NOTE: Price is for ONE box - image is of a variety, and is representative only. 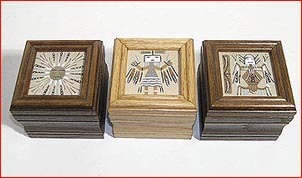 Authentic hand made Navajo Sand Painting inlaid into lid of hand made oak box. Painting measures 3" x 3". Box is approximately 4" wide x 4" deep x 4" high. Inside lid is a card with photo of the Navajo artist with his or her name and home. NOTE: Price is for ONE box - image is of a variety, and is representative only. Authentic hand made Navajo Sand Painting inlaid into lid of hand made oak box. Painting measures 4" x 4". Box is approximately 5" wide x 5" deep x 4" high. NOTE: Price is for ONE box - image is of a variety, and is representative only. 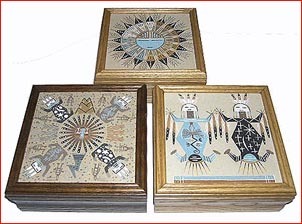 Authentic hand made Navajo Sand Painting inlaid into lid of hand made oak box. Painting measures 4" x 6". Box is approximately 5" wide x 7" deep x 4" high. 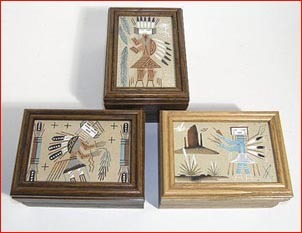 Inside lid of box is a card with a photo of the Navajo artist with his or her name and home. NOTE: Price is for ONE box - image is of a variety, and is representative only. 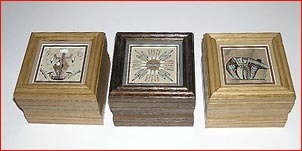 Authentic hand made Navajo Sand Painting inlaid into lid of hand made oak box. Painting measures 6" x 6". Box is approximately 7" wide x 7" deep x 4" high. Inside lid of box is a card with a photo of the Navajo artist with his or her name and home. NOTE: Price is for ONE box - image is of a variety, and is representative only. Authentic hand made Navajo Sand Painting with magnet on back. Painting measures 2" x 3". Note: Price is for ONE magnet - photo is representative only. 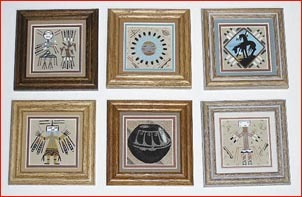 Authentic hand made Navajo Sand Painting matted and framed in oak. Painting measures 3" x 3". Frame is approximately 5" x 5". 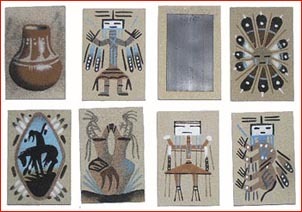 On the back of the painting is a card with a photo of the Navajo artist with his or her name and home. Price is for ONE framed sand painting - image is representative. Authentic hand made Navajo Sand Painting matted and framed in oak. Painting measures 4" x 4". Frame is approximately 6" x 6". On back of painting is a card with a photo of the Navajo artist with his or her name and home village. 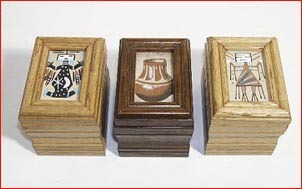 Price is for ONE framed sand painting - image is representative. 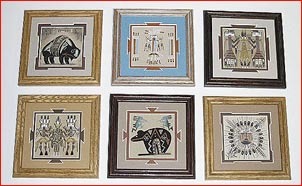 Authentic hand made Navajo Sand Painting matted and framed in oak. Painting measures 3" x 6". Frame is approximately 5" x 8". On back of painting is a card with a photo of the Navajo artist with his or her name and home. 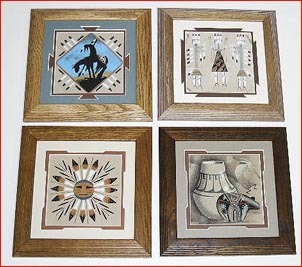 Price is for ONE framed sand painting - image is representative. Authentic hand made Navajo Sand Painting matted and framed in oak. Painting measures 6" x 6". Frame is approximately 8" x 8". On back of painting is a card with a photo of the Navajo artist with his or her name and home village. Price is for ONE framed sand painting - image is representative. 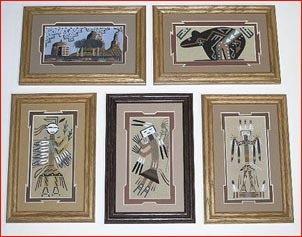 Authentic hand made Navajo Sand Painting matted and framed in oak. Painting measures 8" x 8". Frame is approximately 10" x 10". On back of painting is a card with a photo of the Navajo artist with his or her name and home village. 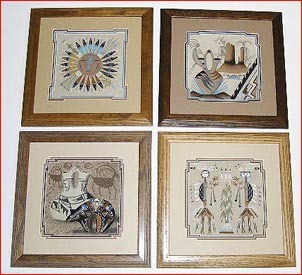 Price is for ONE framed sand painting - image is representative.